On the left is a MacBook Pro 15″ Core 2 Duo with an SSD, the center rotated Dell 22″ screen, and on the right is a Core i7 iMac 27″ decked out with 12GB of RAM. Maybe it’s could just Exposé but it looks like the menubar is still sideways on that vertically oriented Dell, doesn’t it? 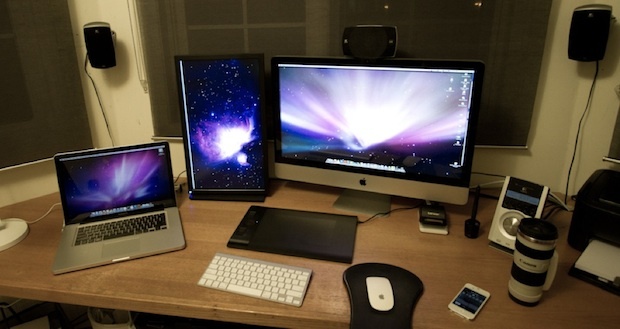 Nice Mac setup, regardless! By the way, the background of the rotated Dell is not the usual OS X desktop background as others, it’s an M42…the real Orion Nebula…..is that the Dell is actually a 22″ digital photo frame instead?